Search results did not yield results. 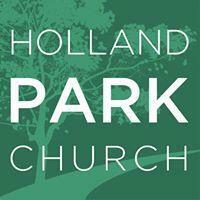 Holland Park identifies itself as a church of Christ. An April 2018 sermon implies at 24:30 that marriage is for "a wife and a husband." This church has a non-egalitarian policy, which makes it automatically non-affirming due to discrimination based on gender identity. This church does not state its actively enforced policy on the main pages of its website. It published a document stating that women are excluded from "providing teaching & preaching and . . . leading the church (elders/deacons/preachers). Because this policy is not found on the main pages of its website, its score is Unclear:Non-Egalitarian.